Hello there! 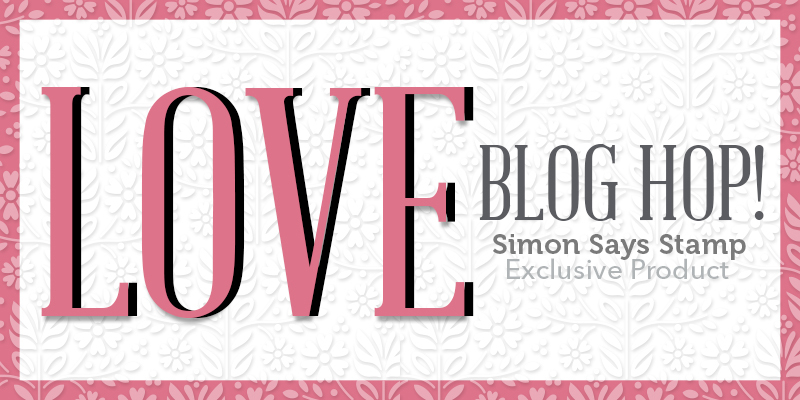 Thank you for stopping by to help celebrate new release from Simon Says Stamp – all about Love! I’ve already shared one card & video tutorial on my blog yesterday – check it out for more inspiration and have 4 more projects to share today! I love working with stencils as there’s just a ton of things that they can be used for. One of the ways to use it, the most common way, is to apply ink through the stencil to create a beautiful background. I used Simon’s Deep Sea ink, it’s a nice deep blue, and blended color through the Folk Dance stencil onto my paper to create a bold background. 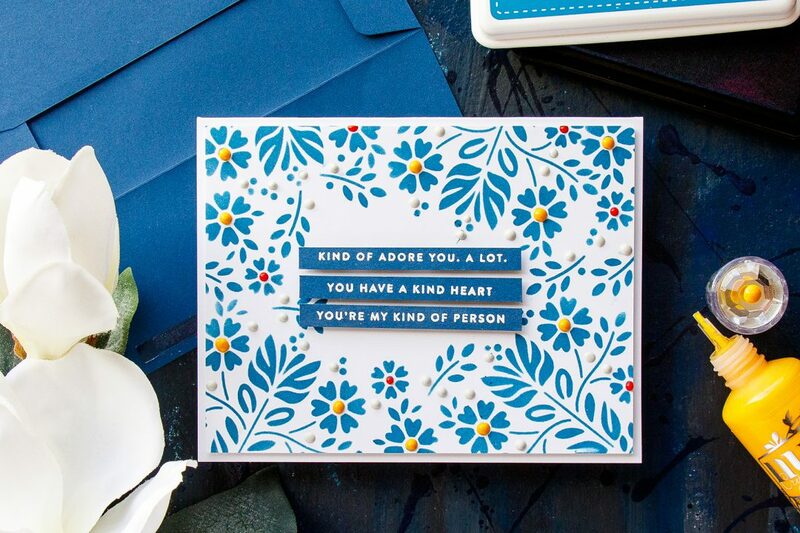 This particular design looked very Scandinavian to me, and I associate blue with this style so I knew I wanted to use a lot of blue, mainly blue color for my cards today. I blended this ink rather heavily onto the paper and I just went with one solid color. If you have smaller ink blending tools, like little daubers, you can do selective ink blending and blend the flowers in red and yellow and keep the leaves blue. You can also dry emboss with the stencil – its like en embossing folder, it can emboss your paper but the impression is not going to be as deep. 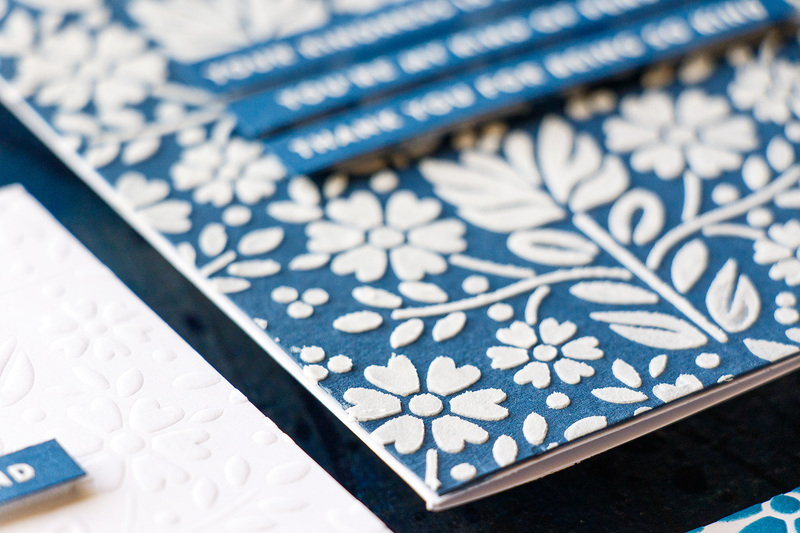 I used my Platinum die cutting machine from Spellbinders to dry emboss my ink blended background as well as just a piece of white cardstock with the help of the stencil. I just love this look of white on white – there’s just nothing quite like it. 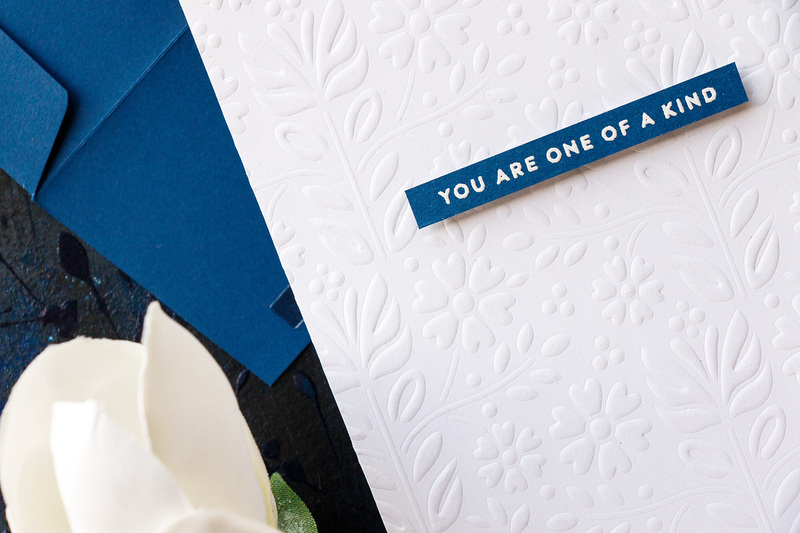 You can also try it on colored cardstock, but white is a winner in my book. Another thing I like to use my stencils with is texture paste. 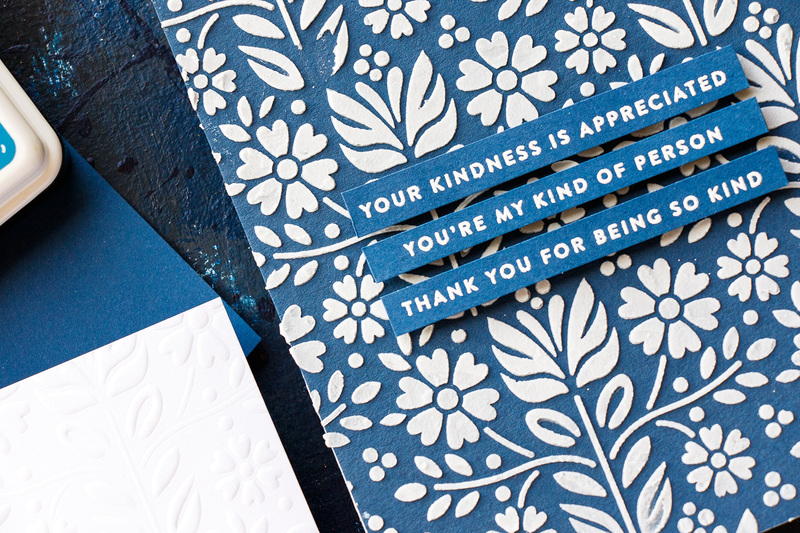 I used texture paste from Ranger and applied a very heavy layer of my paste onto Soft Navy cardstock from Simon Says Stamp – still going for that white and blue look. I loved the result, I got dimension, I got texture – I basically got everything I wanted from this background with this paste. One last thing I wanted to share is using just parts of a stencil. I masked some areas of my stencil so that I could change up the look. 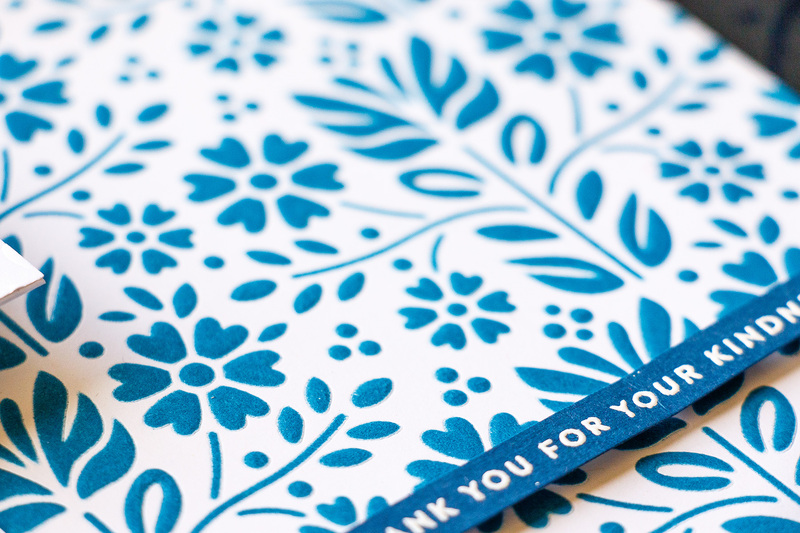 This stencil has a pattern to it – there are repeating elements on it, and I wanted to break it up apart without actually physically breaking the stencil; I wanted to use these elements separately to create a different arrangement on my background. I still used the same elements, I simply changed how they were arranged on my background. 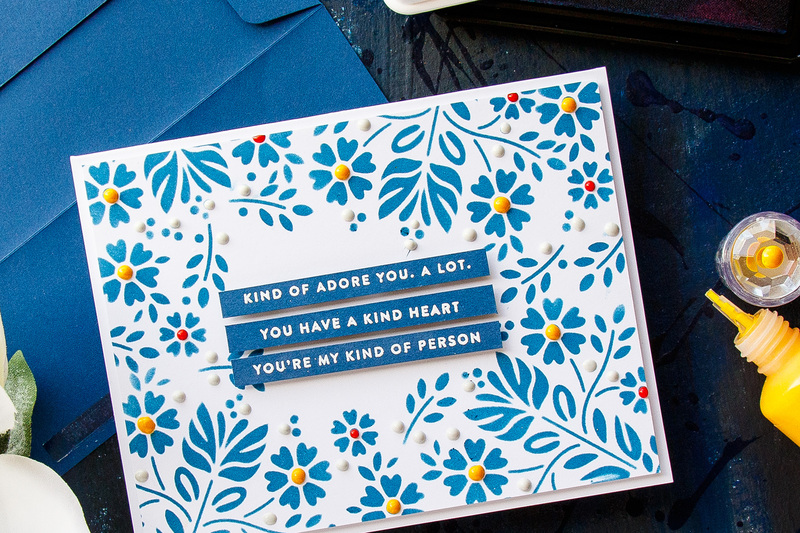 This handmade card uses Nuvo Drops to create flower centers. 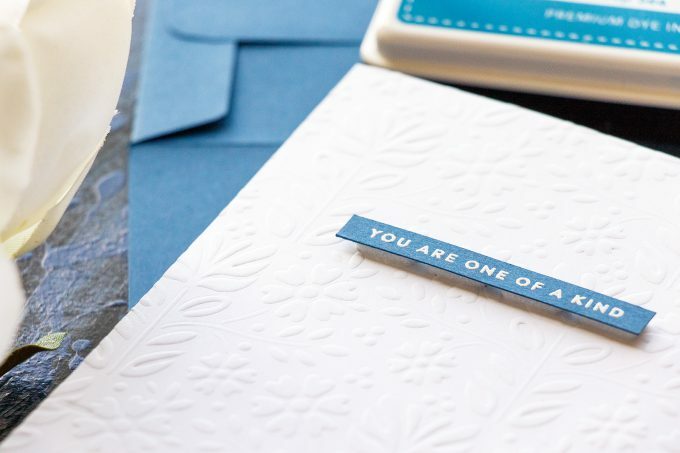 Want to see 4 other ways you can use Nuvo Drops from Tonic Studios in card making? Check out this article – 5 Ways to Use Nuvo Drops. I blended same Soft Navy ink and formed a floral frame keeping the central part of my panel white. 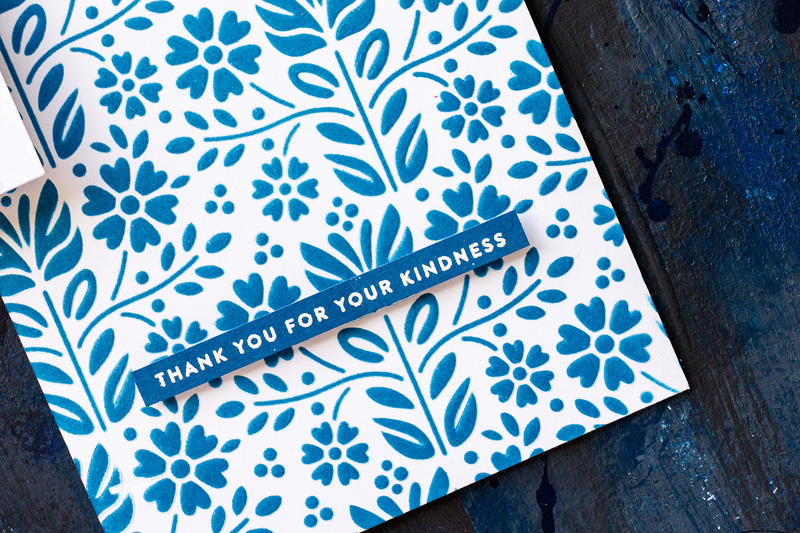 I think I had the most fun creating this background – as it gave me a completely different look to my card. I also added a bit of color this background by using my Nuvo drops in yellow, red and gray. 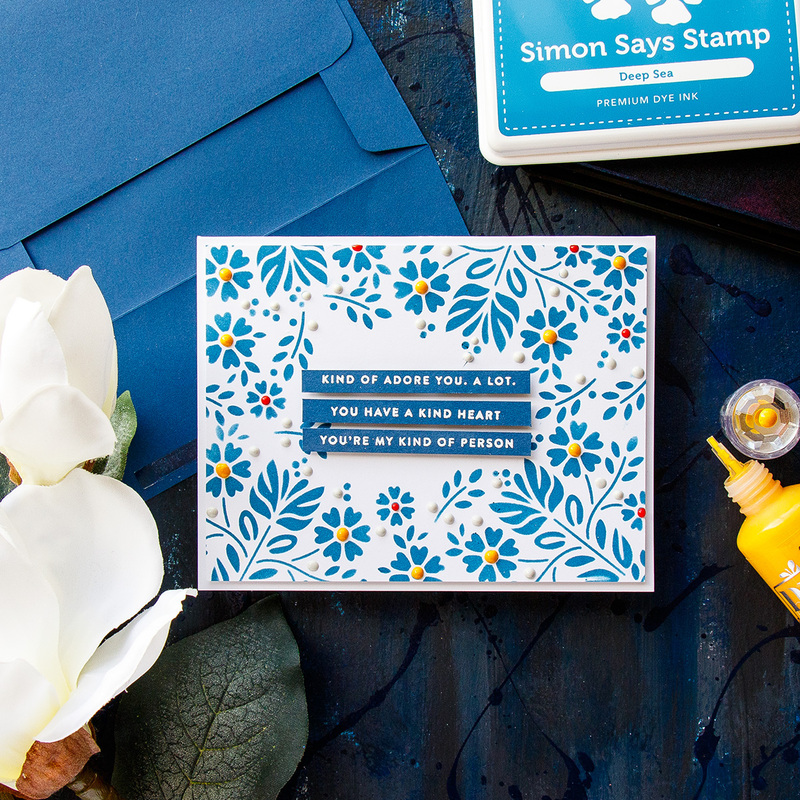 I used gray for the filler dots – so any blue dots that weren’t flower centers I coated a lot of those in gray and than used yellow as the flower center for large flowers and red for the small flowers. And I loved how I was able to easily add color to this background. And this also helped me to cover up some of the imperfect blending spots that I had on my card. 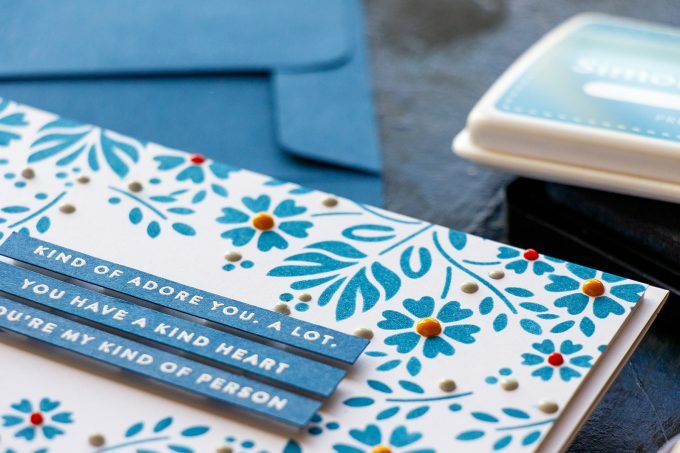 The sentiments for all 4 of my projects came from an older stamp set from Simon – I heat embossed them in white embossing powder onto blue cardstock, trimmed into strips and foam mounted onto the cards. Simon Says Stamp is giving away a $25 coupon to every stop on the hop from blog comment section. So leave a comment below for your chance to win! 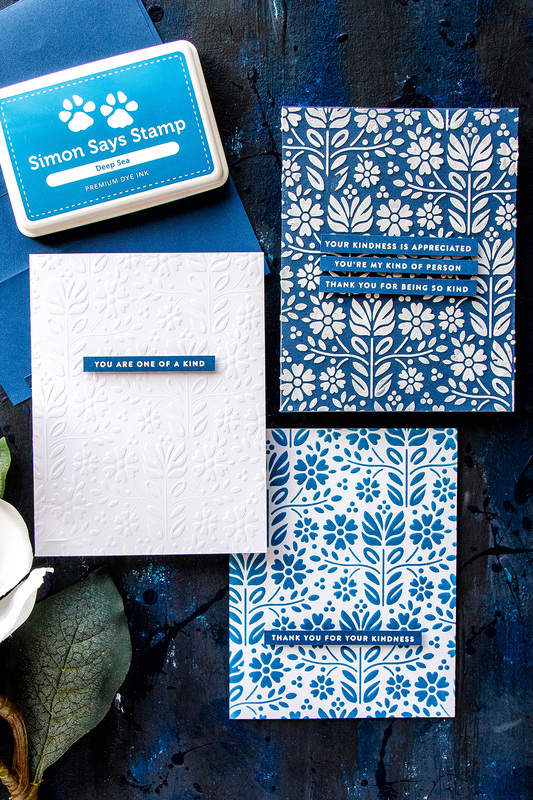 Winners will be announced on Simon’s blog on Wednesday. What a perfect take on the feel of that fabulous stencil. Thanks for all of the inspiration on how to use this stencil! I just purchased it and can’t wait to try out your ideas! I love all the different techniques you can do with a stencil. The cards are beautiful! Very clever, the way you used the stencil four different ways! I always love the fun ideas and creative inspiration you show us! The video is great, too!